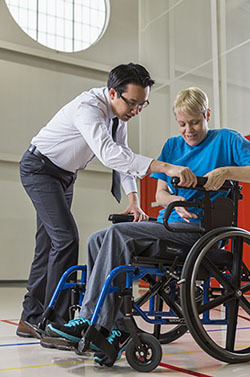 A physical therapist (PT) is a health care professional who evaluates and treats people with health problems resulting from injury or disease. PTs assess joint motion, muscle strength and endurance, function of heart and lungs, and performance of activities required in daily living, among other responsibilities. Treatment includes a broad range of therapeutic exercise techniques, cardiovascular endurance training, and training in activities of daily living.